Careful, Moze. You’ll get a fly in your eye. Or your gonna feel some remorse. Nice of Moses to pop up there with his observations. I any case, both Islam and Christianity are very deterministic religions. Only Christianity gives the illusion of free will. With an omnipotent, omniscient god, however, free will can’t really exist for believers in that faith. One of the best ones for ages! Free will sure is a convincing illusion. I only seem to notice that it isn’t there when I do something I know is stupid and wake up on the floor again. Good one, Author. But did you… uh…. have a choice? Both the affirmation and the denial of “free will” seem equally misleading to me. I’m not convinced that it even MEANS anything for our will to be “free”. Why is the steering wheel on the wrong side? 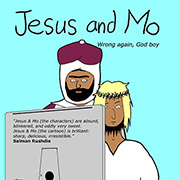 @bo: the comic strip is set in the UK so it shows Mo driving as the English do. On a separate note to the group: even for non-believers, free will may not exist, certainly not in an absolute state. As organic beings, we are hard-wired, to some extent, to respond based on some combination of instinct and social / behavioral conditioning. @bo, the steering wheel is on the correct side for the country Mo is driving in. Why did you assume he would be driving in your country? Mind you, he may have chosen to use an imported car, just to exercise his free will. I think the distinction between philosophy and psychology has become blurred here. That or I’m confused. What about considering constrained will instead of free will. I never could see that exercising one’s will rather than doing what one was told made if free. Mind you, I was only about 13 or 14 when I was thinking about it. I had the misfortune to be sent to a convent for my secondary education, I was so anti Catholic that I gave up learning altogether. Took it up again later tho’, without considering whose will it was and whether I paid for it or it was free. @J Ascher: Too true. But God wants to have his cake and eat it too. In the case of Islam, much of the Koran is stern warnings for unbelievers to repent and choose to follow Allah’s gloriously Straight Path. For the ones who don’t listen, well, Allah had them down for Hell right from the start. Yep. It was part of his plan for them to disbelieve all along. Really. 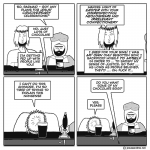 Regarding – Ketil W.Grevstad says: “I also didn’t know that jesus and mo had a sun roof on the car”. Perhaps it is a convertable! for converts. Oh the covertable comment is truely priceless toy boy!!! It does make sense to me that belief has to be a kind of “grace” (or curse, depending on one’s inclination) as I don’t see how I could *choose* to believe something unbelievable. 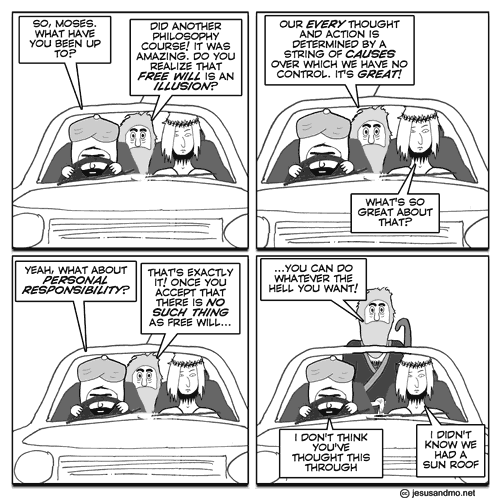 It seems to me that “free will” rarely applies in practical situations. Even if I freely choose A over B, did I also freely choose to choose A over B? It’s an infinite regress… And it gets even more tangled if I start to consider who exactly is the agent that “wills” when I supposedly will something. Author, this one took your cartooning to the next level: philosophical hilarity + TWO sight gags. Super! A lot of Christians don’t take that passage very seriously, but John Calvin was a big fan. Personally, I think the free-will question has little to do with theism in general. A specific religion might make a proclamation about free will, much as religions make proclamations about all sorts of things, but the question in and of itself doesn’t demand any stance on gods. Now that we have gotten stupidly to this point, let us remember that we are in the nano-age, and we will soon realize that our choices are made by all these tiny nano-boogers working in unison to make us act or react. If this analysis hasn’t convinced you, I warn you it only gets worse. I conclude that my “will” arises from all those living nanobots that make up “me.” No matter what, “I” will still be forever responsible for what those bits force “me” to do (lol). After 9/11 I heard several preachers (at memorials for a close family member killed in tower one), when asked why God lets these things happen (thank God I am an atheist), appealed to the “God gave us free will” argument. Sad as I was, I nearly laughed out loud every time I heard this. No wonder the tragedy reawakened the myth of an actual satan walking the world. God cannot be both omnipotent and unresponsible. So I guess 9/11 is one of his mysterious works. Poor Richard says keep your eyes and ears open and be ready to duck. Read the last lines of “Huckleberry Finn” for good advice on using your feet. God cannot be both omnipotent and unresponsible. Epicurus had the right idea when it came to god’s omnipotence. I think Moses parted the car’s roof. @Richard: Your nanobot-responsibility-theory would only hold water if you were a closed system. But both on the genetic and on the memetic level you are everything but. You are only the sum of parts that started out as “not-you”. Yes, it’s funny how, on consideration, the concept of (in) determinism seems to be irrelevant to the concept of free wil because the alternative (that our actions are random) doesn’t seem to be free will, either. So it’s either a meaningless concept, or only sort-of an illusion. Why would evolution go to all that trouble to get things right just so we could stuff it all up with our freewill? You can’t get a “free will” in the U.S., it’s been outlawed by the American Bar Association as being a “Job Killer”. This is because it would stop volunteer paralegals from taking the brie out of the mouths of lawyers countrywide. Your milage may vary depending on where you’re at, geographically. You can’t get a “free will” in the U.S., it’s been outlawed by the American Bar Association as being a “Job Killer”. This is because it would stop volunteer paralegals from taking the brie out of the mouths of lawyers countrywide. Your milage may vary depending on where you’re at, geographically speaking. It’s a question that doesn’t really need an answer. Regardless of whether or not there is “such a thing” as free will, we’re nonetheless required to behave and act as thought there is. I think even asking the question requires investing the concept with a bit more ontological weight than it actually has. Free will is ultimately just about experiencing your choices as choices, and that’s *definitely* true, whether or not we’re simply locked into a chain of cause-and-effect (by God or by the laws of nature). Free will is an illusion. You can accept it or reject it. It’s your choice. @cranker LOL, nice one mate. I posit that if I don’t have free will, then I don’t really exist in any meaningful way. There are two possible conclusions from this: I do have free will, or the concept of ‘free will’ is just a meaningless noise. I tend to the latter explanation, since it would be hard to rationalize the proposal that a non-existent person wrote this. We have free will to make one of two choices – God’s way, or Satan’s way. The illusion is that you believe there is a “Your” way – there isn’t. You got the idea of “Your” way from Satan, in his lie to Eve. I’m predestined to believe in free will. I can’t help it. There is, however, free willy. Moses being able to stand up like that is to show that free will if actual would violate the laws of physics.